Three drill thieves targeted B&Q Brierfield on multiple occasions, stealing five Bosch drills and other tools worth around £500 on two occasions, and attempting to steal another drill worth £115 on a third. Burnley magistrates recently heard how Dean Michael Irving, Wayne Gregson and Francis Duffy were all involved in the offences. 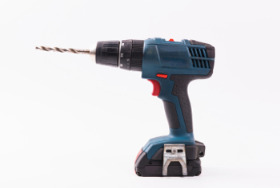 Mr Irving, who has 152 offences on his record according to local press, admitted theft of three cordless drills and three pliers worth around £300 on May 8. He admitted stealing a further two drills worth £210 on May 9 and attempting to steal the £115 drill the following day. He received a nine months drug programme, was banned from B&Q stores in Lancashire and Greater Manchester for nine months and was ordered to pay £220.85 compensation. Mr Gregson pleaded guilty to the £210 drill theft and the attempted theft. He was fined £120 and ordered to pay £70 compensation. Mr Irving's solicitor Mark Williams told the court that his client had money worries due to the cessation of benefits, which he has since managed to reinstate. He added that Irving had apologised for the offences and said it wouldn't happen again.